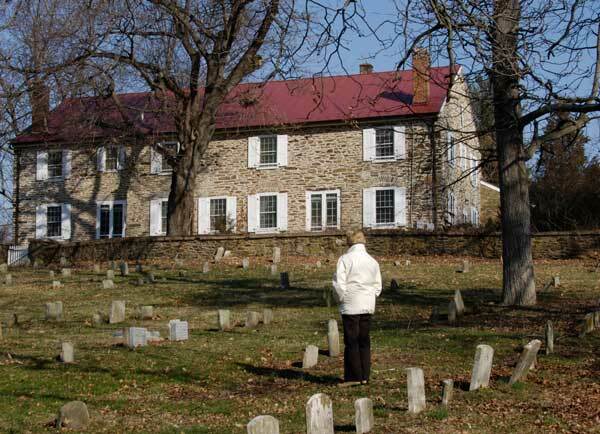 It was in 1733 that Amos Janney with his wife Mary left their home at the falls of the Delaware in Bucks County, Pennsylvania, and came to live in the almost uninhabited neighborhood of Waterford. Other Friends, learning of the good land "at the Pertomock" came in with Amos, or soon thereafter, and an "indulged" meeting for worship was held at his house. Waterford's original Quaker meeting house was built in the 1740s from logs. In 1761, Waterford's Quakers replaced the original meeting house with the right half of this building. Ten years later, they doubled the size of the meeting house to 36 feet by 72 feet with the addition of the left side. Also evident in the photo is part of the cemetery for the meeting house. The building has been used as a residence since 1939. The first Friends, or Quaker, meeting house was built of logs at Waterford in 1741. However, it was not allowed to become a monthly meeting - and thus was on its own, until it had shown 11 satisfaction" to a committee from its various quarterly meetings. All tests were passed eventually and, in 1744, a monthly meeting was begun named Fairfax, taking this name from the county which had just been formed from Prince William. Just in time too, for six couples requested permission to marry at the first monthly meeting. Waterford was known as "The Town" in our early days and the distance members would travel to go to meeting was astonishing. All Loudoun Quakers at that time belonged to Fairfax Meeting and people from what are now the towns of Hillsboro, Hamilton, Lincoln, and Philomont were members of the meeting at Waterford. Like folks of today, however, they had to be prodded occasionally for nonattendance. The minutes of 1762 state that a committee was sent "to visit (them) to excite them to more diligence." To us of the meeting, these historical records are of use in acquiring information on the mores of the day and for genealogical data. Fairfax Meeting members were cautioned against "joining in light company for dancing;" "delt with" for drunkenness; "disowned" for adultery and fornication; a man was "reproved for taking off his hat at a court martial to gain favor with officer in charge;" another, attended to" for encouraging the visit of a man "not in our Society in Courtship of his daughter." A committee on "Spirituous Liquors" kept demon rum away from the door and by 1809 there were no Friends selling spirits. On the brighter side we find that the members provided for the poor, paid the debts of members in hard luck and looked after the widows and orphans. In 1790 a committee was appointed to "care for freed slaves," and later on members were disowned for even hiring them. A school fund was collected in 1779 and a school built in 1805-6. Fifteen members were disowned for taking part in the Revolutionary War. During the Civil War the meeting house sheltered soldiers from both sides; it was especially galling at the first of the War when Southern soldiers were quartered there for months at a time. The swords on the walls and muskets in the comers detracted somewhat from the Friends' peaceful services. The meeting house was badly damaged by fire late in the nineteenth century and, despite a decrease in membership, was rebuilt at a cost of $4,840, a large sum for that day. Membership declined with the years, although Head's 1908 "History of Loudoun, County" states that "Waterford (is) a thriving Quaker settlement." The meeting soon had too few members to continue. It was "laid down" in 1927 and the building sold as a private dwelling house in 1929. Waterford is still a thriving town but one would hesitate to call it a "thriving Quaker settlement." Reprinted from the Waterford Foundation Booklet of 1971.